Sometimes we read Bible stories, especially those we’ve heard many times, from the end to the beginning. By that I mean, because we know the ending, the beginning and middle don’t strike us. We already know that Jesus was the most precious gift every given to the world; we know He redeemed us. We know it was more than worth every word of gossip that was spoken about the young unwed Mary. 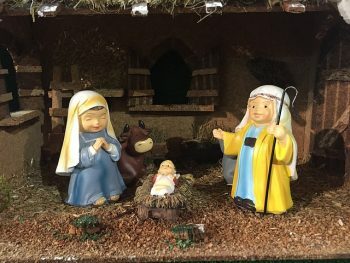 We know the greatness of what God gave us through Jesus makes the Mary’s family angst and social ostracizing, and even labor & delivery among farm animals seem like small prices to pay. I am also grateful that in verse 45, Luke tells us, “Blessed is she who has believed that the Lord’s word to her will be fulfilled.” If we look at the Greek, Blessed comes from a word meaning, “happy, fortunate.” Happy are the women who believe (have faith, believe to the extent of complete trust) that what God spoke to her will be fulfilled no matter how ridiculous or absurd it seems in terms of human capability. Mommas, Gabriel doesn’t have to show up in your living room to hear a word from your Lord. He may use a dear friend, a mentor, an impression in your heart, your time in the Bible, or even your OB/GYN. And, let us be like Mary — let us give ourselves entirely to what God has for us believing with complete trust that God will fulfill His word to us. When you believe you have heard from Him, check in with scripture and bathe it in prayer. God will give you peace and faith to believe Him if it is His word–the same kind of peace and faith with which He filled Mary as she listened to Gabriel speak.